So begins tenancy at one of the most famous addresses in all of literature. Within the timeline of the stories, Holmes lived in London at 221B Baker Street from approximately 1881 to 1903. 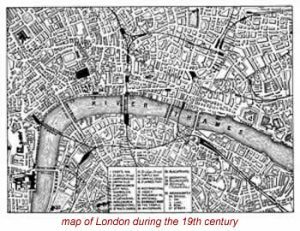 During this time, the later part of the Victorian period, the British Empire was at its zenith and London was the center of all things.At the beginning of the Victorian era in 1837 the population of London was 2 million. The city’s population at the time of Queen Victoria’s death in 1901 was estimated to be 6.5 million.The East End of London contained the neighborhoods where the poor and working class lived. The more affluent people lived in the West End. Neighborhoods in the West End included Mayfair, Kensington and Regent’s Park. Baker Street was also located in the West End. While there really is a Baker Street, there was no 221 Baker Street during the years of the Sherlock Holmes stories. Baker Street was very short, less than a mile long. The street ran north to south with numbered addresses ranging from 1 to 85. In 1930 some of the surrounding streets were renamed, buildings were renumbered and Baker Street became much longer. At that point 221 Baker Street was a real address. Soon after this the building at 221 Baker Street was demolished. A new structure, Abbey House, took its place. Abbey House served as the head office for the Abbey Road Building Society from 1932 until 2002. Because of the unique relationship between the company and Sherlock Holmes, Abbey commissioned a statue of Holmes. That statue now stands at the entrance of the Baker Street Tube Station. Abbey also hired a person to deal with the cards and letters, as many as 30 a month, that came addressed to Sherlock Holmes. In March of 1990, the street number 221B was assigned to the Sherlock Holmes Museum. While that would seem to fitting, the move actually lead to some controversy. Who would answer the mail addressed to Sherlock Holmes? Also, the number 221B bestowed on the Museum by the leader of the Westminster City Council was out of sequence with the other numbers in the street. Other council members thought it was more important to have logical, sequenced addresses. In 2005, Abbey National left their headquarters in Baker Street. At that point, the Royal Mail recognized the museum’s right to receive mail addressed to Sherlock Holmes.